Aubrey Roberts leads a pack of runners. The junior made history and became a two-time All-American this weekend. 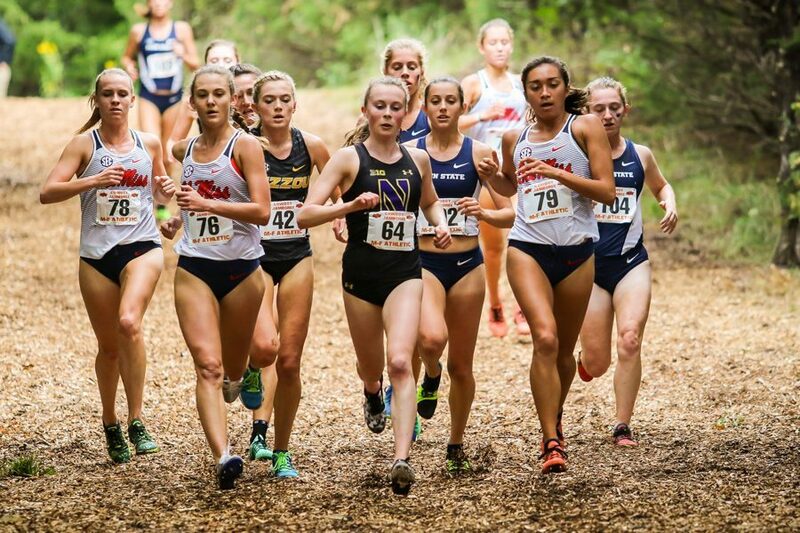 Northwestern has competed three different weekends this year, and each time, junior Aubrey Roberts has proven herself as the greatest female athlete on campus. An All-American this past fall, Roberts has kept up her excellent pace with a first-place finish and two school records since the calendar turned to 2019. First, the Wisconsin native won the mile race at the Illini Classic with a time of 4:52.75. Then, she set the school record in the mile at the Meyo Invitational two weekends ago with a 4:43.88 mark. This past weekend, the powerhouse claimed the school record in the 3,000 meters at the Iowa State classic. The mile record was previously held by Jena Pianin, who ran a 4:49.81 in 2015 at the Grand Valley State University Big Meet. Roberts breezed past that record by six seconds, and her time at the Illini Classic was, at the time, the third-best in history. Roberts is not the only runner who is proving herself during the winter months. Freshman Rachel McCardell earned a spot on Team USA after finishing in seventh place in the 6 km at the USATF Cross Country Championships. McCardell ran with a time of 21:45. As a member of Team USA, she will be competing at the North American, Central American, and Caribbean Cross Country Championships on February 16 in Trinidad and Tobago. Freshman Sielle Kearney finished in 11th place in Tallahassee and freshman Sara McCoy came in 26th. Over the past two weekends, the Cats’ team has been split, and have gone to two different events. On Feb. 2, some NU runners were in South Bend, Indiana for the Meyo Invitational and USATF Cross Country Championships in Tallahassee, Florida. Over the past few days, Cats competed at the Grand Valley State University Big Meets in Allendale, Michigan and the Iowa State Classic in Ames, Iowa. At GVSU Big Meets, junior Kelly O’Brien had two top-five finishes. She finished in fourth in the mile with a 4:48.65 time and a fifth in the 3,000 meters with a 10:04.77. Ahead of her in the 3,000 meters were junior Sarah Nicholson and Kearney. Nicholson was the runner-up with a 9:53.61 and Kearney came in fourth place with a 10:02.00. The only other competitor to join Roberts in Ames was senior Isabel Seidel, who finished in 28th place in the mile. NU has one more match – the BU Last Chance Invite – before the team members who qualified for the NCAA Indoor Championships will travel to Birmingham, Alabama.